Celia Barss is the farmer (boss!) at Woodland Gardens. Celia has been cursing the clay fields here in Athens for over a decade. Celia was born in Newfoundland Canada, raised in Papua New Guinea, lived in France, grew up in Baltimore and is a graduate of the University of California Santa Cruz Organic Farm program -- where she got really used to living in a tent on the side of the Pacific Ocean. 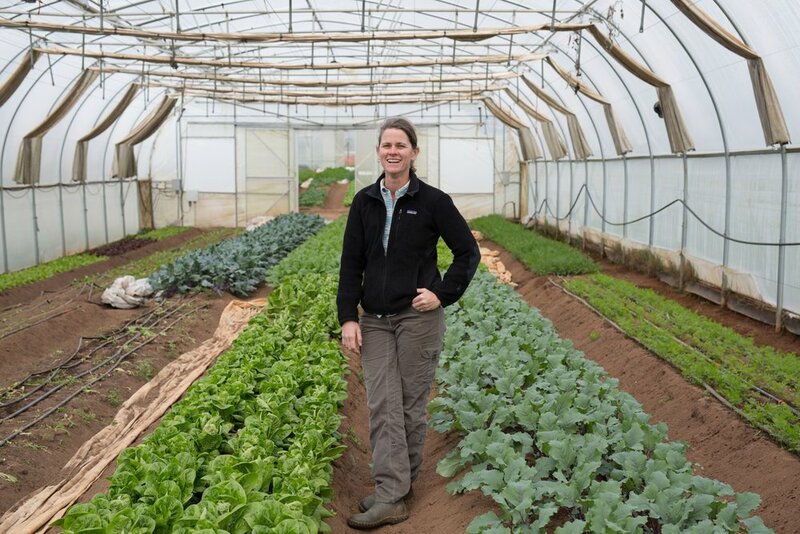 Celia has been involved in the start up and operations of four farms, and simply would not be happy doing anything else. Celia has always managed the farm with a tough strength and endurance that anyone who meets her will attest to, and a always with utmost respect for her team. This is not a job that can be done alone! Among the bustle of the seasons, Celia is a mother of two, and keeps her boots dirty. Kelley Walton is one of the assistant managers at Woodland Gardens, focusing primarily on cut flowers and perennials. Kelley is somewhat new to the world of farming full-time and is excited to continue learning and growing in Athens. She took a leap of faith in 2017 when she decided to leave her career in the non-profit sector to apprentice at Jenny Jack Sun Farm in Pine Mountain, Georgia and has not looked back since. Kelley studied Sociology and Spanish at Tulane University in New Orleans and loves going salsa dancing and playing soccer when her legs aren't too tired from being out in the fields all day. We are so thankful to have Kelley join our farm. Cory McCue is an assistant farm manager at Woodland Gardens. His primary job at the farm is to manage the weekly Veggie Box program, but you will often find him keeping up with the farm's revolving list of maintenance responsibilities, construction projects, and any of the many “to-do list” tasks the farm requires to keep moving forward. After a short apprenticeship at Planted Rock Farm in Chattahoochee Hills, Georgia, Cory returned to his home in Columbia, South Carolina, where, after a brief period away from farming, he was introduced to Celia Barss and her amazing Cabin Branch Farm. Following a great year at Cabin Branch, Cory was pleased to follow Celia to Athens, where he enjoys the satisfaction of a hard days work, and continuing to learn the many aspects of production on an organic farm. Cory is a kind fellow with an incredible work ethic and a big smile on his face that comes in handy on long, hot days. South Carolina misses Cory, but we are thankful he is here! John Cooper, a South Carolina native, continues to consult for the farm. He worked for many years with Woodland Gardens bringing a business background and skills in botany, perennial production and business management during a time a growth for the farm. John has an International MBA from University of South Carolina, and many years of experience in the nursery industry and small business management. His experience includes work for a large cooperative of Fair Trade and organic coffee producers in La Trinidad, Oaxaca. John thrives outdoors, of course, and loves adventures with his wife, Celia and their two rascally kids! Lauren Cox managed Woodland Gardens in 2015 - 2017. A native southerner with wanderlust, Lauren settled in Georgia five years ago to begin her farming education. After receiving her Masters in Food Culture and Communications from Slow Food University in Italy in 2008, she returned to America in 2011, armed with a yearning to get back to her roots and get her hands dirty. She managed Le Tre Lune Farm (Italian for “The Three Moons”), with Luca Caffettani, from 2011 to 2013. She continued to spreading the good word of food and the importance of taste education along with sustainable farming practices. Every spring she can’t wait for the tomatoes to come in, so she can have a mayo and tomato sandwich and of her varying interests, she does modern and Middle Eastern dance, and at one time played golf and sang opera. Lauren is an amazing person and Woodland Gardens was lucky to have her contributions. Luca Caffettani comes from the land of cured meat and cheese but found himself ever more at home in the southeastern US. After Wwoofing around Europe and living for a brief period in Rome, he moved to America in 2011 to begin his formal farming education in Mansfield, Georgia. For two years he co-managed, Le Tre Lune, before becoming the newest addition to Woodland Gardens’ management in 2015. Luca brought with him a passion for soil health and experience with farming implements. His favorite veggies are mustard greens and radicchio and he makes the best ragu' e.v.e.r. Since leaving Woodland Gardens at the end of 2016, Luca has returned to Italy and is working on a handful of projects dealing with sustainable, organic small-scale farming in Emilia Romagna. Christine White has been involved in the Athens and Atlanta sustainable agriculture scene since graduating from the University of Georgia in 2010. Her love for farming began while she was serving at Farm255 (dearly missed but never forgotten!) and volunteering at its own Full Moon Farms. In 2012, inspired to learn more about growing food, Christine apprenticed at Serenbe Farms where she learned the great challenges and rewards of farming in the Southeast. Post-apprenticeship, Christine returned to Athens to continue her farming journey in one of her favorite towns where the music, yoga, familiar faces and good coffee is a-plenty. She is excited to be Lauren’s partner-in- crime here at Woodland Gardens and to carry on the farm’s great tradition of growing and delivering diverse and beautiful veggies to the community.